Rubber Weights | Qualiform Rubber Bumpers U.S.A.
At the end of your feet lie ten of the best reasons to consider Bumpers solid rubber weights. Your toes chances of being smashed or broken are greatly reduced by using Bumpers instead of conventional metal weights. Bumpers solid rubber construction protects the athlete as well as saves wear and tear on Olympic bars, and weight room floors. It’s no wonder that many professional sports teams and major universities have begun to use Bumpers. There are of course no sure things in your battle against injuries. But at least Bumpers will give your toes a fighting chance. 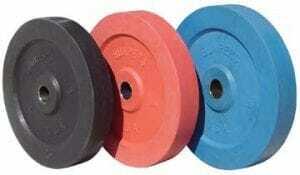 Bumpers are available in 45 pound black plates, 35 pound red plates and 25 pound blue plates. So if you are serious about safety call (330)336-6777. Some of the organizations now using Bumpers U.S.A. Bumpers U.S.A. are manufactured by Qualiform, LLC of Wadsworth, Ohio. Solid rubber Bumpers are produced of the highest quality and workmanship. Solid rubber weights, rubber bumpers, compression molding, transfer molding, injection molding, rubber to metal bonding, rubber parts manufacturer, rubber products manufacturer.